You thought that it was all over, well it isn't! Thanks to the anonymous person who added a comment to another post to the effect that the 2nd class book of 12 (stamps coded MTIL) from 2018 (M18L) have been found printed on SBP1 cover paper. These are on eBay (1 left as I write) https://www.ebay.co.uk/itm/352577066756. I'm sure the seller won't object to the image appearing here. I'll try to get one that shows the MTIL clearly, and it will be added to our shop as soon as we can get some. The number in our catalogue will be 2931.8a. 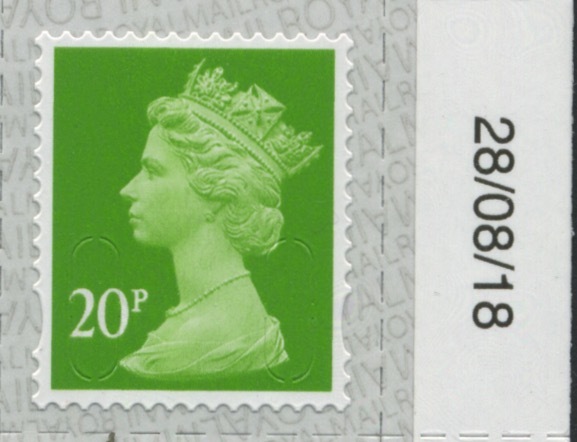 A further printing of the 20p counter sheet, 28/08/18, is different to the other two 20p printings; this will be added to our shop shortly, with number 3020.8b. Third printing 28/08/18 - blue phosphor only. 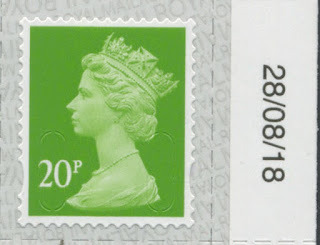 The 20p from this August printing is also on SBP2i for the first time - the previous two were on SBP2u. Packs of 2nd Class dated 04/12/2018 contain SBP2 printed booklets. 2018 Special stamp issues update.